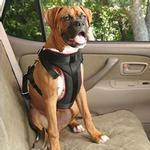 The Vehicle Safety Dog Car Harness is great to use in all vehicles! Upper and lower adjustable straps. D-rings on harness for quick clip in. 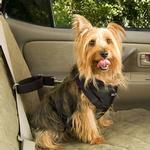 This well made Pet Vehicle Safety Dog Car Harness by PetSafe is designed with your pet's safety and comfort in mind. 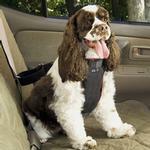 This versatile design allows your pet to sit or lay down on vehicle seat while safely secured to vehicle seat belt. You can also use the vest as a walking harness by attaching a leash to the D-ring on back of the harness. 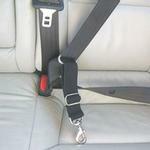 The safety strap detaches and may be left the in vehicle. Straps are adjustable on the fully-padded safety vest for the perfect fit! Padding is cool in summer and warm in the colder months. The adjustable safety strap has a swivel clasp and is made from a special material that is strength-rated, but provides a slight amount of stretch to absorb shock in the case of a sudden stop. A unique leash design integrates with the vehicle's seat belt tensioning device, thus providing range of motion while traveling, but in the case of a sudden stop it locks in place to keep pets secure. This design also makes it easy to load and unload your pet, and installs easily in ALL vehicles. Use of a vehicle safety harness also improves safety by reducing potential distractions for the driver. Cleaning: safety vest is machine washable in cold water. Small fits dogs: Chest 12-21" Neck 12-18" Weight 6-25lbs. Medium fits dogs: Chest 15-24" Neck 16-24" Weight 20-55 lbs. Extra Large fits dogs: Chest 23-40" Neck 24-32" Weight 60-120 lbs. Vehicle Safety Dog Car Harness Customer Photos - Send us your photo! Daisy May wearing her new Vehicle Safety Pet Harness along with her new shades and bag pack that come in today. Posted On 09/27/17 by Krista W from , WI Yes, Krista W recommends this product! Came as expected, the harness is flexible yet very sturdy, I was impressed. Posted On 12/16/16 by Kristina S from Avon, NY Yes, Kristina S recommends this product! It fits! It looks great on him. Im hoping it will last on him (cause the last one I bought like this didnt last long in this style) The very 1st one I love and even though the chest part is gone from wear and tear Im still using it after 2years. Posted On 02/16/16 by Maria T from sylmar, CA Yes, Maria T recommends this product! Posted On 04/23/15 by Maggie from Norfolk, VA Yes, Maggie recommends this product! We've had other types of harnesses for our dog but this one is definitely a better quality and style. I like that the front part that covers the chest has a good quality padding and larger area of coverage too. I feel like my dog will have better support and less impact on his chest and heart area if we have to stop suddenly and the restraint holds him back. Glad we purchased this product for our 'baby' (who is a 60 pound black lab). Perfect for our needs! Posted On 11/08/13 by Yvonne R from Harrington, DE Yes, Yvonne R recommends this product! Posted On 11/07/13 by K I from Burleson, TX Yes, K I recommends this product! This is a wonderful product. Easy to use and holds my 50+lb dog securely.